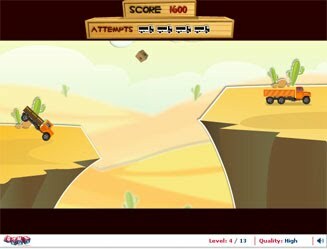 Loadshifter is a game that tests that classic combination of brain and brawn. While on one hand you want to throw a heavy load in to another truck, over deep gorges for obstacles, you also have to make sure it falls exactly into the storage area of the other truck. While you balance the cargo, you must also get the timing right! Press ‘left’ and ‘right’ arrow keys to move forward and backwards. Press space bar to launch goods into another truck. Collect bonus point at every level. Win the ‘Brain-and-Brawn’ Medal for scoring 1200 points!